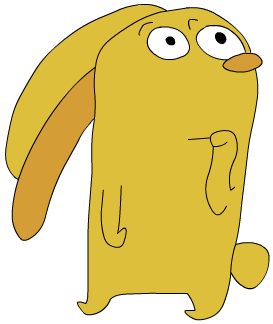 Untalkative Bunny is the cartoon show of a delightful, facially-expressive, yellow-coated city-living bunny. UB aired in Canada on Teletoon from April 2001 to May 2004. Feedback and contributions at welcome. Thanks for dropping by! Thank you to Dynomight Cartoons. We are a fan site unrelated to the creators of the show. Unfortunately full season DVDs of the show are not available and unlikely to be released.